Park Systems, world-leading manufacturer of Atomic Force Microscopes (AFM), just announced new Park NX12, an affordable versatile platform for analytical chemistry and electrochemistry researchers and multi-user facilities. Park NX12 features a versatile Inverted Optical Microscope (IOM) based SPM platform for SICM, SECM, and SECCM, in addition to Atomic Force Microscopy for research on a broad range of materials from organic to inorganic, transparent to opaque, soft to hard. "We just purchased Park NX12 because we wanted a high quality research grade, easy to use, versatile, and high resolution AFM/SICM/STM platform," commented Prof. Yixian Wang from the Yixiam Wang Laboratory at Cal State LA. "The Park NX12 was the only comprehensive platform that could perform all SPM techniques (AFM/STM/Pipette based SICM) while also utilizing IOM, for the nanoscale measurement flexibility we needed. We are happy with a very affordable product with so many features and such accurate data." 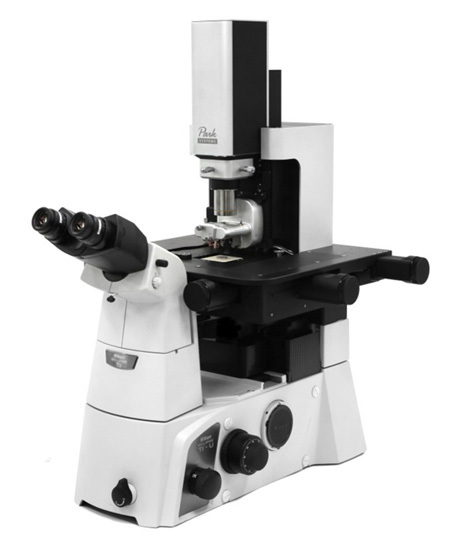 Park NX12 combines NX10 base with NX-Bio's XY stage that mounts on an inverted optical microscope and supports all of the available modes and options for NX10 with enhanced optics. The Inverted Optical Microscope (IOM) feature is designed to work with transparent samples using a pipette based technique and utilizes PinPoint™ mode in liquid for nanomechanical characterization. "Park NX12 is vastly superior to existing solutions by offering the best value research grade high-end IOM based SPM platform, guaranteeing researchers highest resolution pipette based measurements," commented Keibock Lee, President, Park Systems. "Ideally suited for multi-user facilities, the unique modular design is a versatile platform designed for further development." Park NX12 is suited for advanced research on materials such as membranes, organic devices and electronics, and biological and pathological samples. There are outside institution inquiries for characterization of biomedical devices and materials. "Our multi-user research lab uses Park NX-Bio and can see the strong advantages in the versatile and comprehensive design of Park NX12," commented Prof. Lane Baker, James F. Jackson Associate Professor of Chemistry, Indiana University. "Park Systems is a customer-centric manufacturer who carefully listens to their customers' needs and develops new products based on customer input." Park NX12 also solves the challenges in material characterization for clean and renewable energy applications and sensors by providing enough resolution of existing SECM techniques for high resolution detection of interfacial transport and surface chemistry. It also has studious handling for the pipette probes used in SECM characterization and similarly transparent materials such as nanopore membranes (for fuel cells) and biomembranes (for sensors). Park NX12 offers ease of use in both air and liquid, a solution and platform for pipette based SPM techniques (e.g. SICM, SECM, SECCM), and an AFM/optics solutions with broad optical access to the scanning probe and standard features of Park's line of Atomic Force Microscope products including SmartScan™, revolutionary point-and-click fully automated AFM software.